It is an ugly time in the automotive industry. So bad, that even the beloved Toyota is down 23% last month. A lot is changing in the U.S. (and global) economy and it is hitting the Big Three (GM, Ford and Chrysler) and international automakers hard. Unfortunately, like the U.S. consumer, the Big Three are highly leveraged and spending more than they bring in. The financial crisis is hurting U.S. automakers two fold: in higher lending rates as they borrow to keep operations going and secondly in the ability of customers to get credit approval. One of the big issues that is exacerbating the sales decline in automotive is the new lending standards forcing many borderline or less-than-perfect borrowers out of the market. The whole lending industry is in a giant stalemate as banks continue to suffer large write-downs of bad debt when just a year ago they were lending hundreds of thousands of dollars to anyone with a pulse, forget proving you had an income or could rub two nickels together. So, here we are in one of the worst global financial crisises since the Great Depression. The Big Three are currently pushing the public for a government bailout between $25-$50 billion. This is suppose to buy the automakers sometime while the banks eventually relax their lending standards; thereby, allowing more buyers into the market. Buying time will not quickly turn Hummers into Priuses; instead, this is about giving the industry cash to continue operations in an environment that has stopped lending to firms with bad balance sheets, and yes all three U.S. automakers have some pretty dismal balance sheets. Without going much more into what the situation is from an economic or political perspective, I want to look at what the Big Three are doing from a marketing perspective. Instead of our usual topic of selling products, GM and Chrysler are doing advocacy marketing through two online efforts: GM Facts and Fiction, Chrysler’s Corporate Blog and Grab Democracy By the Horns. Chrysler has started posting some of their corporate blog content on YouTube and they maintain a blog off of their Chrysler Listens website. The videos advocating support for a government bailout are almost laughable. Autoblog chastised Chysler for “breaking out the handycam” as the videos reek of amateur corporate training video quality. The voiceover and pictures of Washington DC, a flag in a factory, and random ‘action shots’ inside corporate headquarters I’m sure is something the employees of Chrysler were forced to watch. Really, who would watch this unless someone was paying you? (Oh wait, I watched them and no one is paying me right now… hmmm better rerun my MSN Time Valuation Calculator.) Unfortunately, the Chrysler advocacy videos probably won’t budge the political debate in the Big Three’s direction. Then again maybe I’m wrong, maybe Chrysler’s low budget approach just makes you feel sorry for them. Yeah, I’m right. It does nothing. The new effort is a bit more consumer friendly, Grab Democracy By the Horns. Really? Grab Democracy by the Horns? Are we supposed to wrestle democracy down to the ground with a lasso and tell it to fork over some of those billions? Worst Website Name Award aside, the site is a bit more advocacy friendly than the Chrysler corporate blog. Unfortunately, it must be a work in-progress as several of the links are not working. For example, apparently no one has "Shared Your Story." Supposedly, people are to share their woes of being a private equity fund and the pain of a bad investment in the auto industry. I have to admit I love it when GM creates new websites to stay engaged with consumers and brand advocates, like they have done with their Fastlane Blog, or when they have tried to redefine the energy debate with their GM Next website. GM is out on the Internet trying to actively define issues and GM Facts and Fiction is no exception. The homepage of the site calls visitors to action with their “Mobilize Now” and “Get the Word Out” action links. The Mobilize Now section actually categorizes a user’s own advocacy by the type of person they are. For instance, if you are a retiree, you get a custom letter to send to your congressperson. Employees, suppliers, dealers, and my personal favorite “Concerned Americans” all have form letters or phone statements prepared by GM to show support for a bailout. The site also provides several Myth and Fact statements and a Learn More About the Crisis page that links out to several articles, polls, et cetera that show third-party data and information about the auto industry’s current situation and how a bailout would help America, not just GM. It is an interesting approach and one that is significantly better than the corporate video route Chrysler is taking. 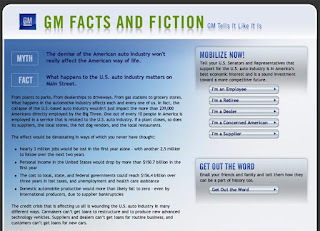 GM feels it can best educate it’s advocates through knowledge and defense against some of the “myths” it feels are currently clouding the debate. Much like any political discussion, GM is using Facts and Fiction as a tool to improve advocacy by improving the insight of those supporting the bailout or by convincing those on the fence that the bailout is a good thing for all Americans. There is even a social networking angle that popped up on my Facebook profile this evening. Someone from Digitas (GM’s digital agency of record) started a Cause group called “Support the US Economy by Supporting the US Auto Industry”. Most of us who have joined are there for self-interest, I’m sure. It is, however, an interesting way to get the word out across social networks and may even drive some traffic to GM Facts and Fiction, which is prominently featured on the Facebook Cause page. So where is Ford in the Big Three advocacy play? They have decided to opt out and focus on future product as evidenced by this recent article in The Detroit News. Ford is trying to play this one under the radar. They definitely want aid and some reports have said they have maybe 7 months of cash to burn through before having the same issue as GM, but Alan Mullaly wants to show that Ford is a healthy company and just wants aid as a matter of fairness if his cross-town rivals get any help, i.e. why should GM and Chrysler get any competitive advantage through lower lending rates or cash availability. In the case of the auto-makers' bailout, it's a relief to have a national issue that is so straightforward: American cars tend to break down and fall apart therefore people are not buying them. If GM and Ford don't want to go out of business, they should start making decent cars. To bail them out would be to reward their terrible manufacturing standards.